Parker DKI offers professional cleaning, disinfecting, and freshening services for almost any item using the revolutionary Esporta Wash System. Originally designed for use on sporting equipment, the Esporta Wash System is now used to clean, disinfect, and freshen a wide variety of items. The ES3300 Washer / Extractor is the only wet wash machine in the industry that is designed to recover soft goods that have been contaminated by fire, smoke, or water damage. Its patented design features “safe hold” compartments for handling delicates, leathers, and Category 2 & 3 soiled laundry. The ES3300 is extremely efficient; it can disinfect, deodorize, and wash 160 lbs. of laundry, shoes, and/or other soft goods WITHOUT OZONE in approximately 60 minutes. The Esporta Wash System effectively removes bacteria, mould, and fungus from sports equipment, camping gear, personal protective equipment, and other soft items that could cause health concerns for players and others. The water-based wash system is clinically proven to kill contaminants and to ensure the highest level of hygiene and safety for athletes and others using the gear. Parker DKI conducts a bacterial swab test of the equipment before and after every cleaning session to provide clear evidence of the effectiveness of the Esporta Wash System cleaning process. This measurement of the before and after bacteria count clearly confirms the health value of the cleaning process. It’s common knowledge that sporting gear can begin to smell unpleasant after a few games or practices. 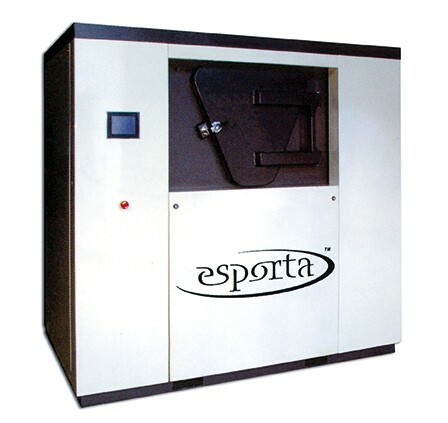 The Esporta Wash System cleaning process was designed to get the gamey smell out of your game gear. Not only does this process eliminate odours, it also cleans and disinfects your gear! Teams and training programs that provide equipment to many players want to ensure their gear is clean, fresh, and free from bacteria. The Esporta Wash System cleaning process is especially valuable when multiple individuals use the same equipment. Our Esporta ES3300 system provides remarkable results that can be demonstrated through bacterial swab measurements before and after. We can provide effective cleaning, freshening, and disinfection of virtually any type of sports gear and/or equipment. Emergency services personnel including firefighters, police, military, and EMS professionals rely on their personal protective gear to keep them safe from the elements they encounter on the job. Emergency service professionals’ equipment requires the same diligent cleaning, freshening, and disinfecting procedures as sports equipment and we’re pleased to be able to provide that service at our facility. Aromatic fragrance (a combination of 140 different natural oil extracts including mint, orange peel and vanilla flower) introduces a fresh renewed pleasant fragrance that lasts for weeks. Now that you have learned how amazing the Esporta Wash System cleaning process is, what is the next step if you have some items that you would like to have cleaned? Call our office today to schedule a cleaning session and we will set you up with an appointment to drop off your material. We will tell you how long it will take to complete the cleaning process and how much it will cost. We are certain that you will be amazed at how simple the cleaning process is and how remarkable the results are! Don’t wait another day! Call today to rejuvenate your items at Parker DKI. We are your restoration specialists!